Florida always calls to me in winter. 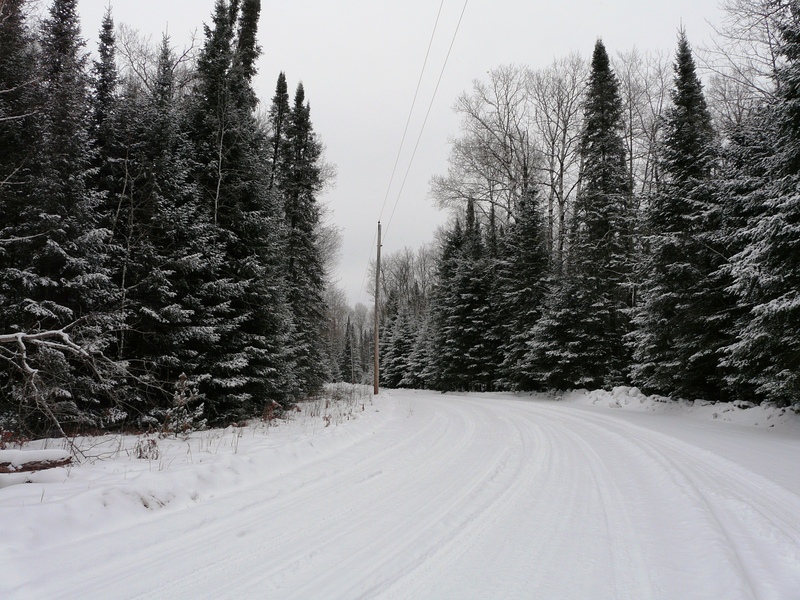 Especially this year, as I really wanted a break from the unusually cold weather we are having in North Carolina. The only prep I did for this year’s trip was to sign up for the Space Coast Birding Festival, so imagine my surprise when I checked eBird my first night on the road. THREE Ruffs were currently being seen in Alachua County, Florida. And, two of them were in the Home Depot retention pond that was not a mile from Liz’s house! I took this as a sign that the birding gods would favor me on this trip. 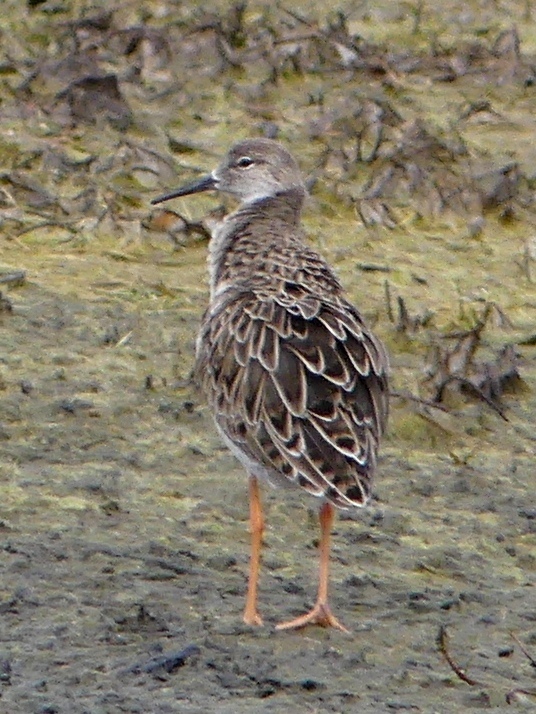 The male Ruff in Gainesville. With the wind blowing his neck feathers up, you get a hint of what he will look like in breeding plumage. For my non-birding friends, Ruffs are shorebirds. 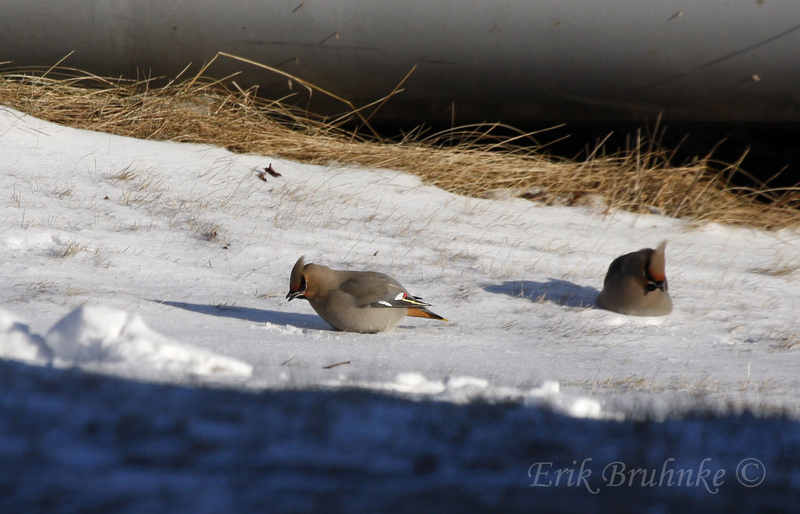 You might even call them boring when they are not in breeding plumage (and we rarely see them in breeding plumage here in the US), but they are rare and birders love rare birds. Previously, I had seen only one Ruff in 10 years of birding, which I wrote about in A Smooth Trip for a Ruff. With the Ruffs waiting for me in Florida, I got on the road early the next morning. I got to Gainesville around noon and went directly to Home Depot. It could not have been easier. 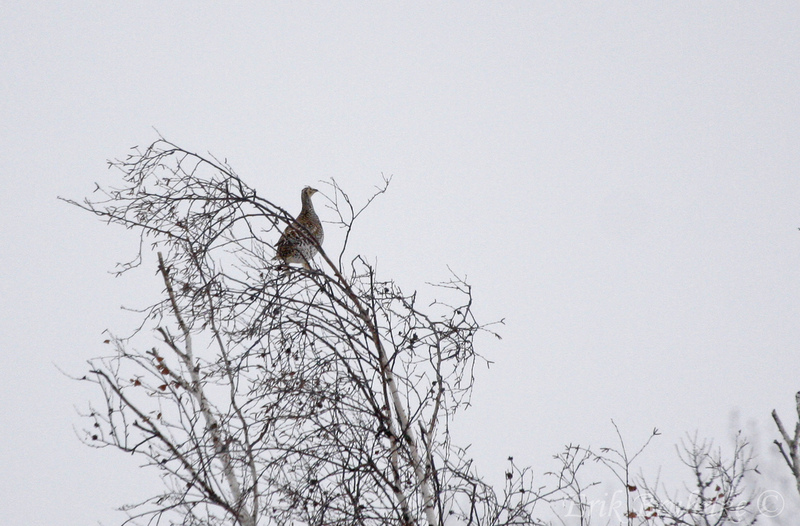 I walked over to the pond and immediately found both Ruffs, a male and a female, and shot some photos. Birding mission accomplished, I then went to visit with my step-daughter, Liz, and my two granddaughters, Quinn and Casey. Next it was south to Dunedin for a couple of days with my friends, David and Val. 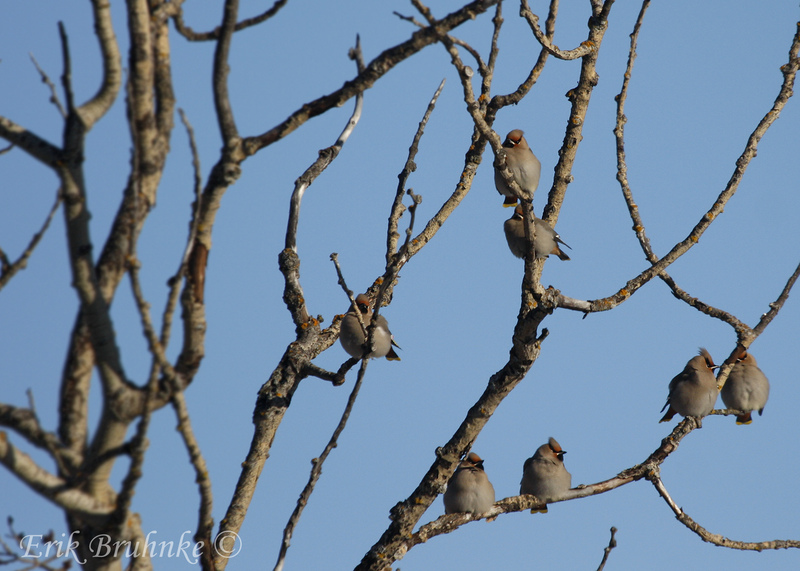 Another rare bird awaited me near their house, 10 of them actually. For the last two years, Brown Boobies, seabirds of tropical waters, have wintered in the unusual location of upper Tampa Bay. David and I went in search of the boobies and found 6 of them roosting on towers in the bay shortly before dark. The boobies were too far out for good photos, but a pair of Greater Scaup swam close by the pier at Safety Harbor. This pretty bird is the female. The next day we went to Possum Branch, one of our favorite local birding spots. 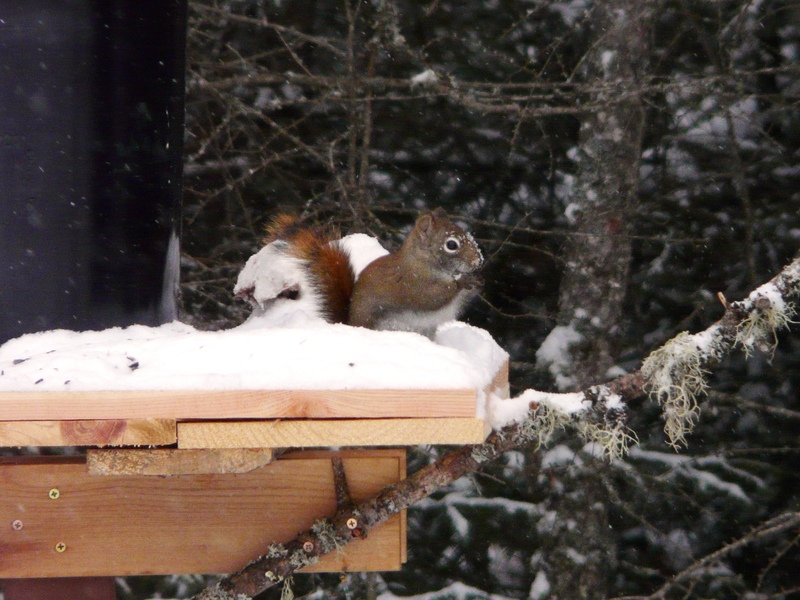 We heard lots of Yellow-rumped Warbler chips as usual, but suddenly one higher pitched chip stood out. We stopped and looked hard for the little bird. David finally found an olive-colored warbler with a grayish head that looked like it had been dipped in a a light wash of yellow. 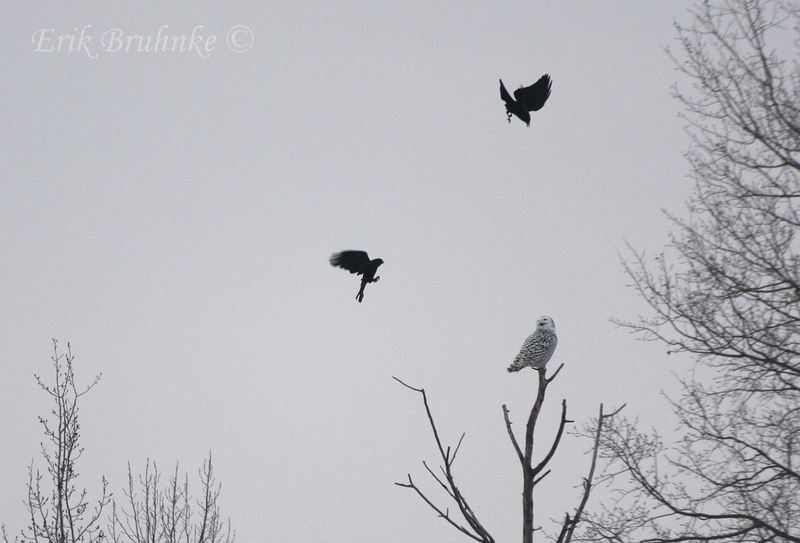 I was never able to get my eyes on that bird, but the next morning my luck would change. David headed to work and I left for my drive to the east coast. But, first I went to Kapok Park, another of our favorite spots. I heard the chips again and this time I saw several of the plain little birds, which I could now confirm as Orange-crowned Warblers. I was very happy that I even got a photo. My warbler story may sound boring, but I hope not. For what is more important, not just in birding, but in life, than the little joys of new discoveries, the sweetness of finding unexpected beauty in plainness? All made sweeter when shared with a friend. Life birds are great, but these magic moments are what I live for. My next four days were filled with gulls. 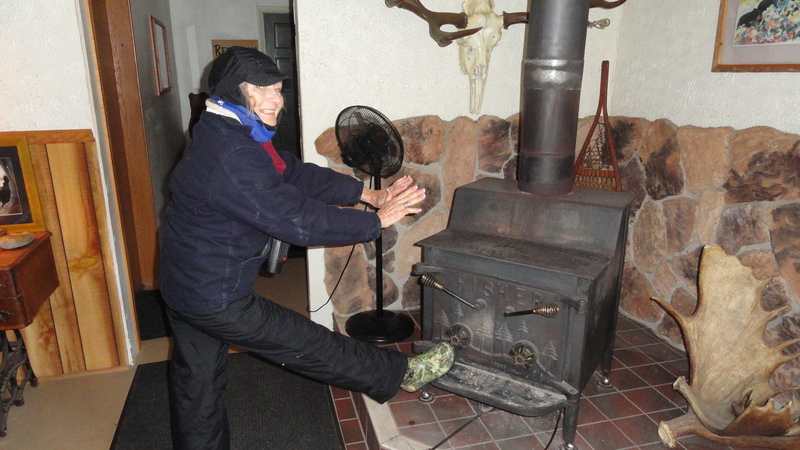 I had signed up for almost all the gull field trips and workshops that the festival offered. That’s a lot of gulls even for a normal birder, but I wanted to learn all that I could. On Wednesday, we started with a trip to the Cocoa Landfill. After a short introduction to the workings of the landfill, we headed out to look for birds. We saw Laughing, Ring-billed, Herring, Lesser Black-backed, and Bonaparte’s Gulls. I was signed up for the “Gull Fly-In” at 3:30 that afternoon, but Amar Ayyash, one of the trip leaders, said that he was going early and that I was welcome to go with him. We grabbed a quick drive-thru lunch and ate in the car as we headed to Frank Rendon Park at Daytona Beach Shores. This particular stretch of beach is popular with wintering gulls. 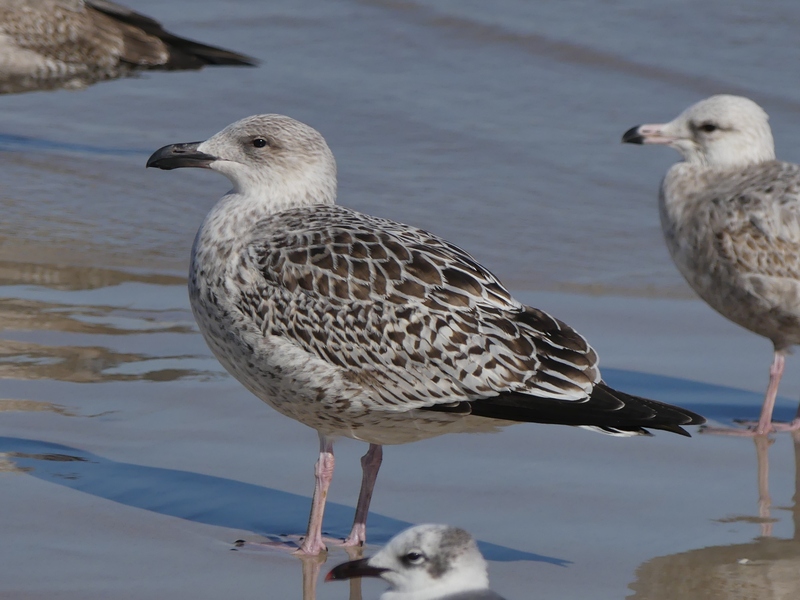 It has been estimated that as many as 50,000 gulls sometimes roost on the beach. They come in big numbers late in the afternoon for a few hours before heading offshore for the night, but at 1:00 PM, there were enough birds to keep us busy. 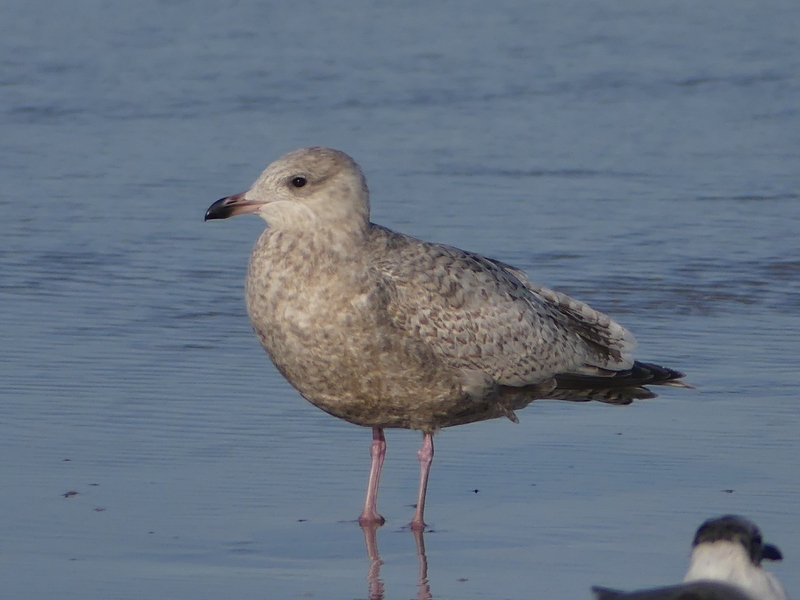 Amar quickly found all the expected species – everything we had seen at the landfill plus Great Black-backed Gull – as well as a couple of hybrid candidates. I tried to soak in all the information that I could, but, as a beginner, I was overwhelmed. I took as many photos as possible for later study. 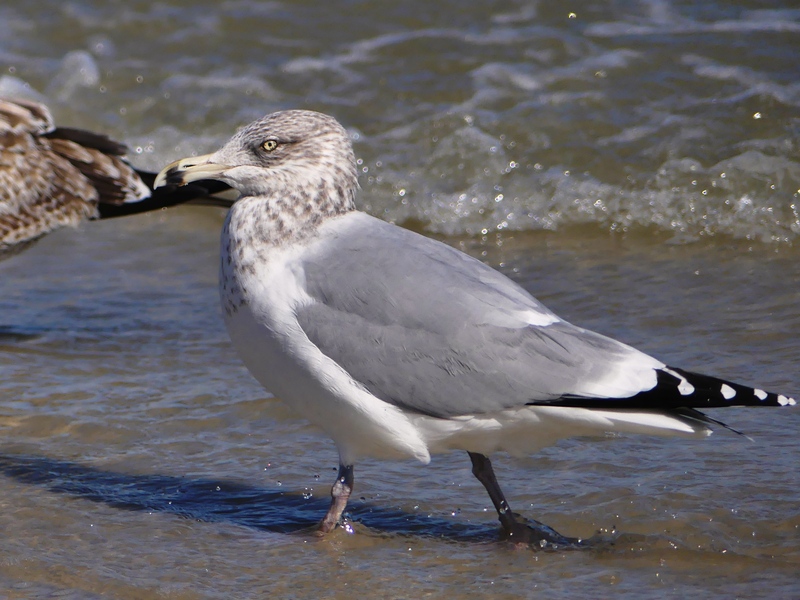 This bird has a ring on its bill, so it’s a Ring-billed Gull, right? Nope, it’s a Herring Gull. Most common field marks only apply to adults. 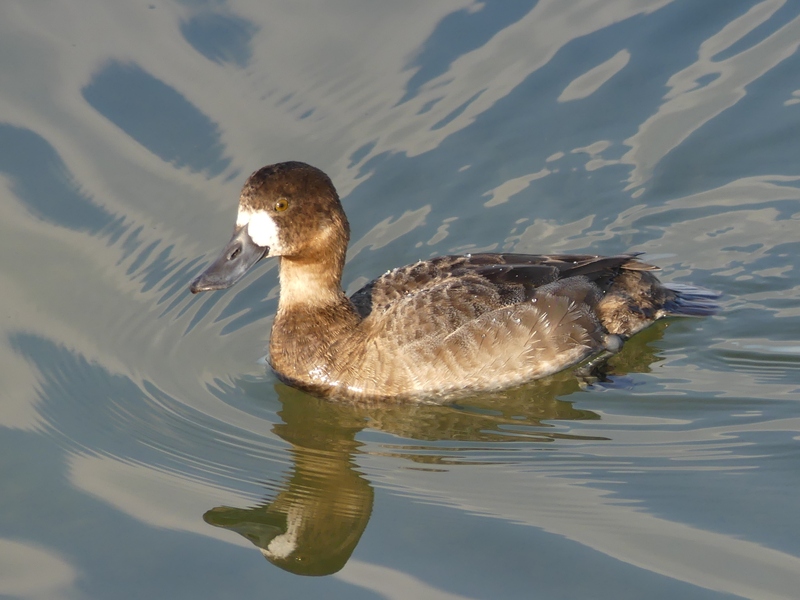 This bird is an “adult type,” probably a 4th cycle bird, but not yet fully mature. Hmm. What’s this bird with the dark tip to its bill? 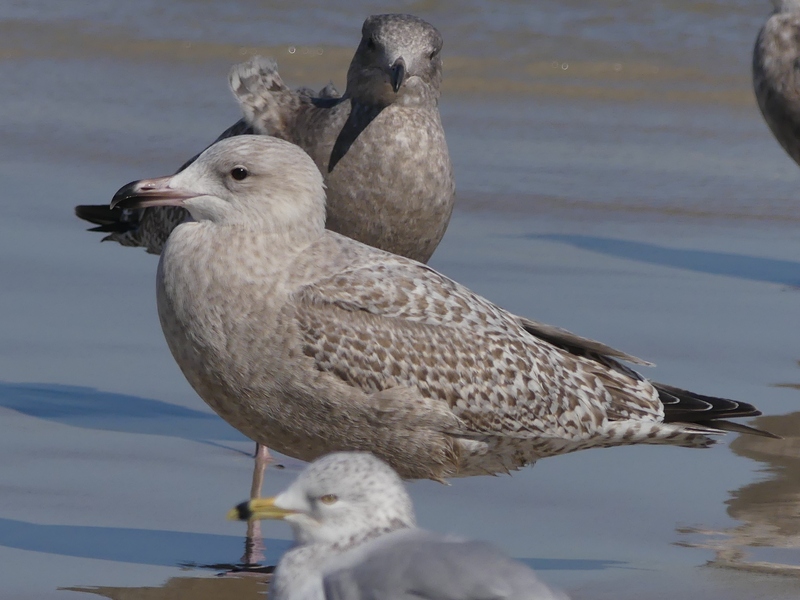 Yep, another “adult type” Herring Gull. 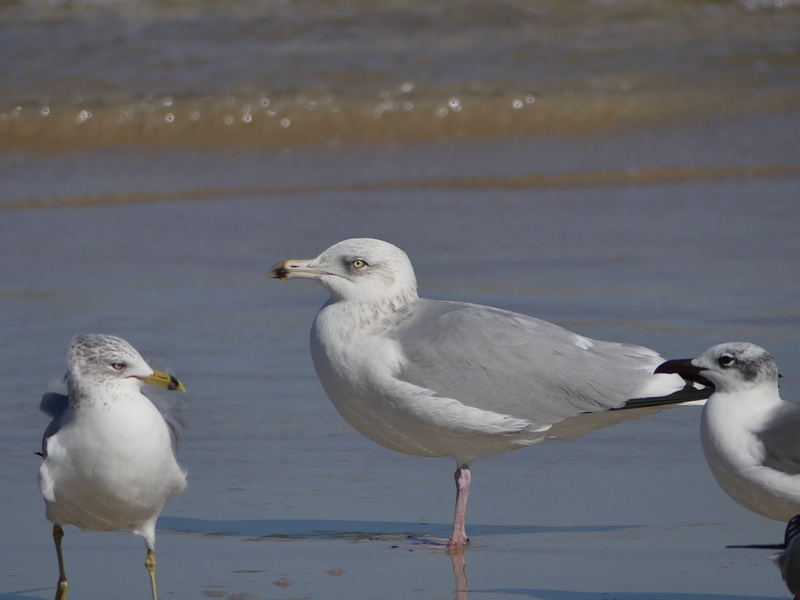 The smaller bird to the left is an adult Ring-billed Gull. A 1st cycle Great Black-backed Gull. 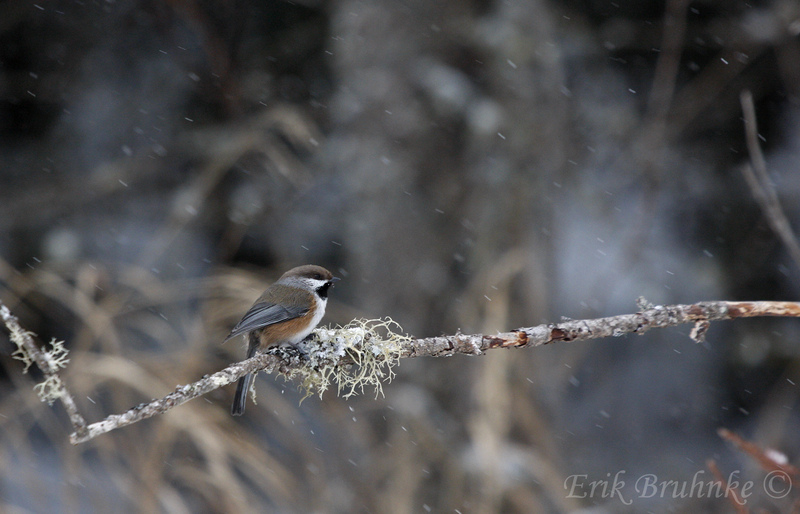 We saw quite a few of these beautiful birds. I love the clean, crisp pattern. And, all of this was before the official festival field trip even began! 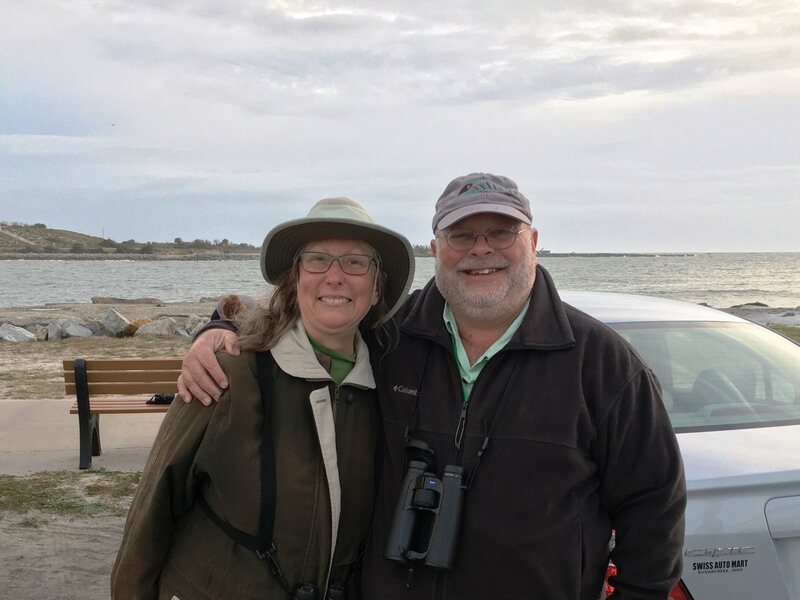 After we were joined by Michael Brothers, Florida’s leading gull expert, and the 30 to 40 festival participants, we continued walking on the beach, sometimes only about 20 feet from the birds, until 6:00 PM. We saw literally thousands of Laughing and Ring-billed Gulls and good numbers of the other species, too. 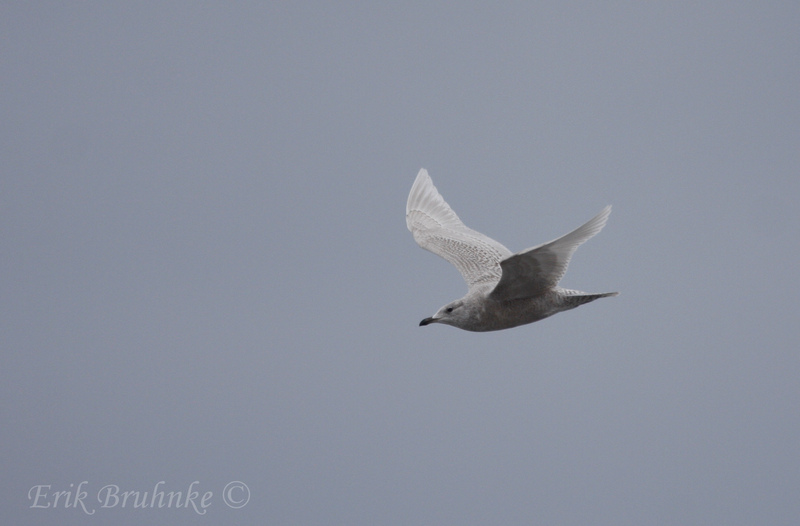 We added Iceland Gull to our list with two individuals. 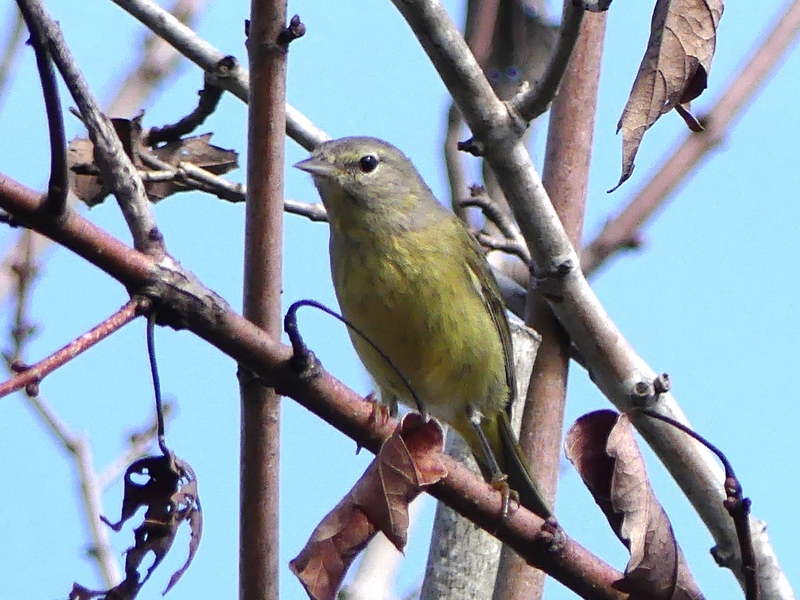 A few appear in Florida most winters, but they are unusual enough to be considered rare. The next morning, it was back to the Cocoa Landfill. I considered skipping a second trip to the same location, but I woke up early and decided that it would be a good chance to study the Lesser Black-backed Gulls that we had seen on the first day. After the talk about the landfill, we went to the area where everything was covered with a black tarp and water had collected on top. There was a little shallow pool at one end and the others walked down there to see the Bonaparte’s Gulls. 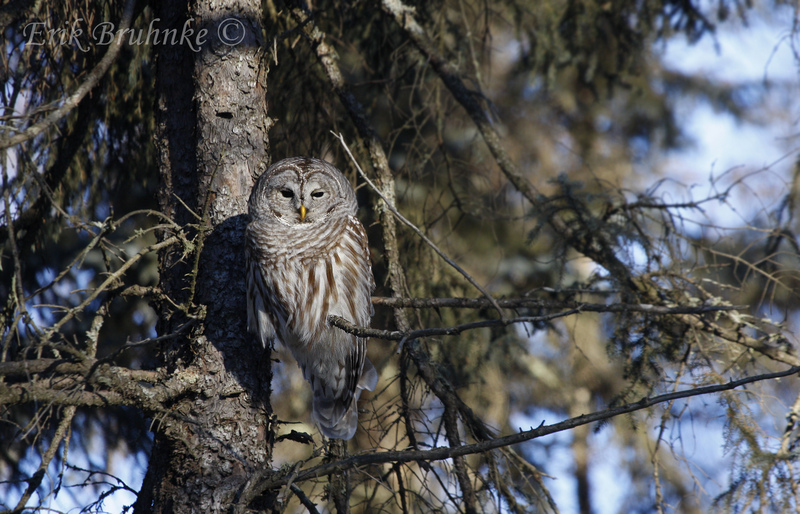 I had seen them the day before, so I stayed put, fiddling with my camera, when Chris Brown, one of our guides, came to get me. “Shelley, I think you will want to see this.” As I hurried to where the others had gathered, the bird with a red bill immediately caught my eye. 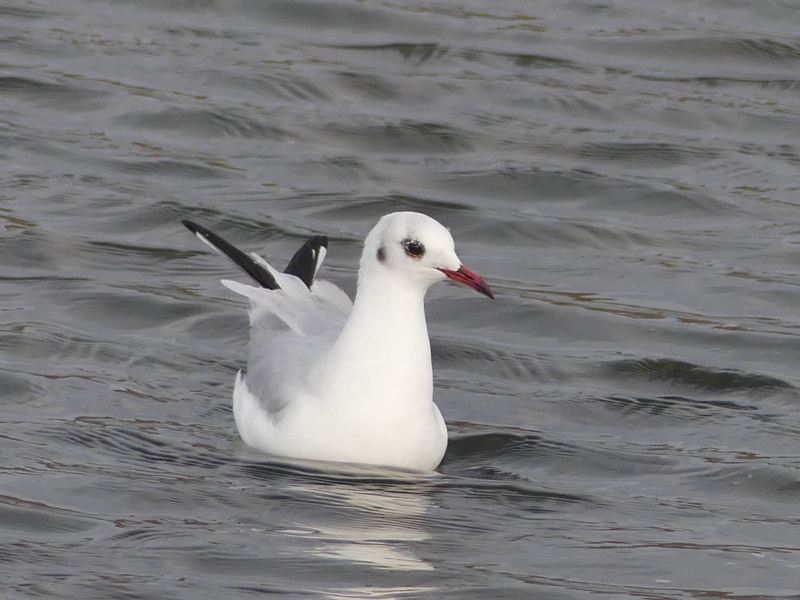 “OMG, it’s a Black-headed Gull,” I squealed, delighted to finally see this species in the US. 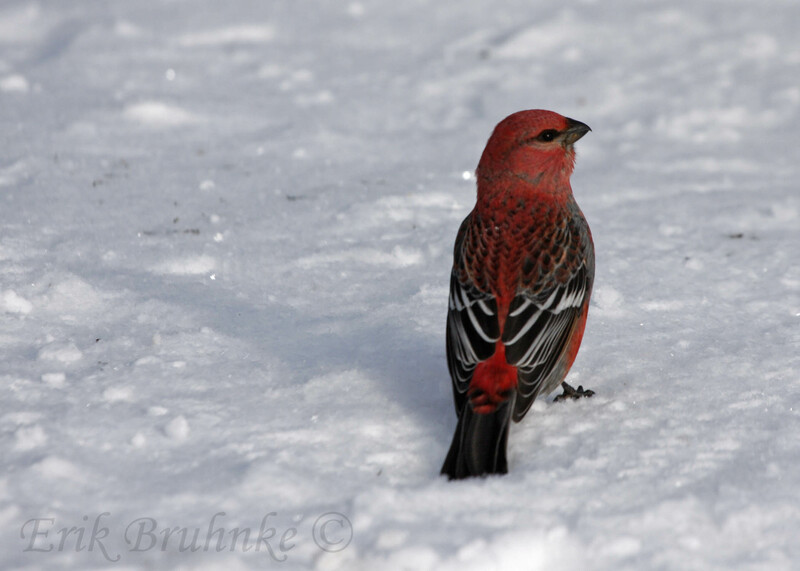 And, this was a beautiful bird, a healthy-looking adult, giving us a much closer view than I’d ever had in China. I enjoyed the rest of the festival, especially Amar’s gull identification workshop. 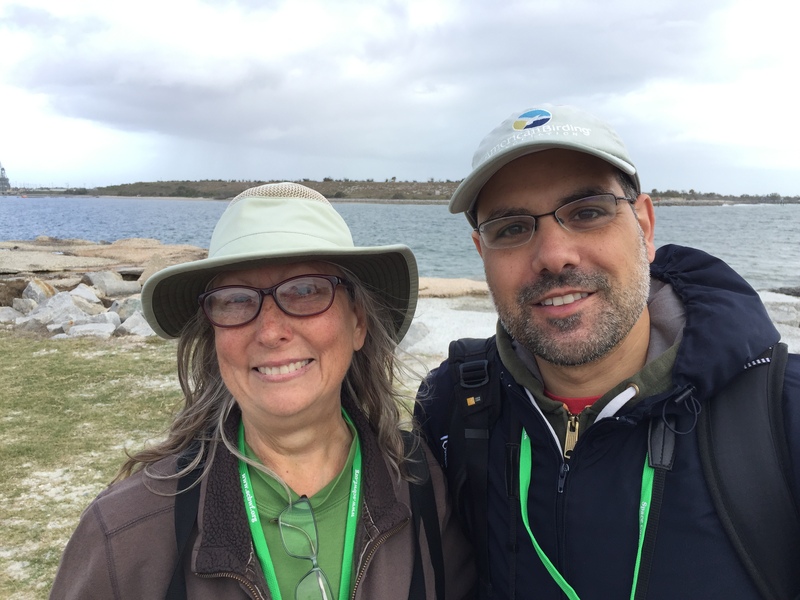 Amar is a living encyclopedia of knowledge about gulls and my goal is to learn enough that I can follow his discussions on the Facebook group, “North American Gulls” and his blog Anything Larus. The last field trip that I’d signed up for was to Jetty Park at Cape Canaveral on Saturday morning. The trip leaders were Amar, Jeff Gordon, and Greg Miller, one of the birders featured in the book and movie “The Big Year.” While waiting for everyone to arrive, Greg and I quickly discovered that we are distant cousins. It was fun to meet Greg and I’m looking forward to future discussions about our shared ancestors. Jeff Gordon reminded me that he was a birding guide before he was ABA President when I casually asked if we might see any Northern Gannets and a few minutes later he pulled in a gorgeous adult nice and close. I had seen thousands of them in NC, but this was a new Florida bird. I never get tired of watching these beautiful birds plunge headfirst into the water. 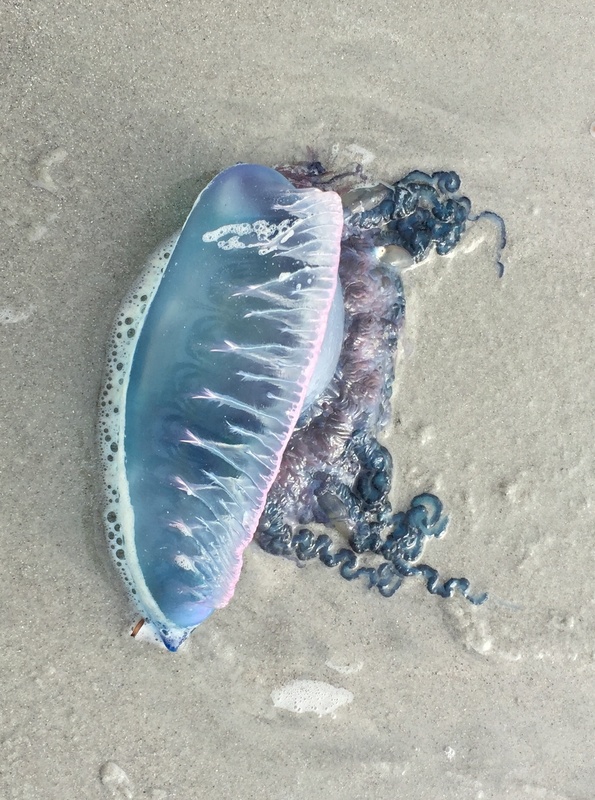 Our leaders that morning were alert to anything interesting and found this Portuguese Man o’ War washed up on the beach. They are not really jellyfish, but the closely-related siphonophore, a colony of individuals. Jetty Park was the end of the festival for me. The time with Amar had significantly improved my gull knowledge and ID skills and I enjoyed seeing old friends and making new ones. But, my time in Florida was not quite up yet. 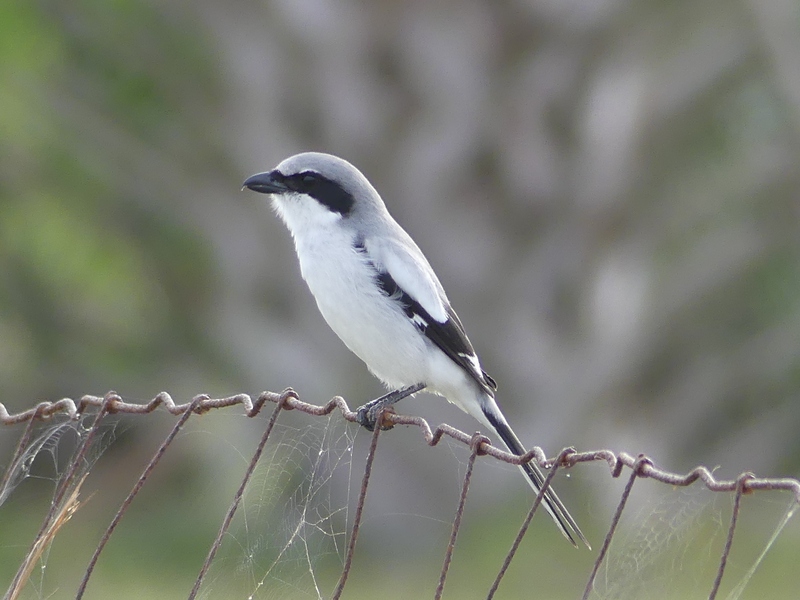 What’s a trip to Florida without a Loggerhead Shrike? I observed this bird at Viera Wetlands calling and singing almost continuously. 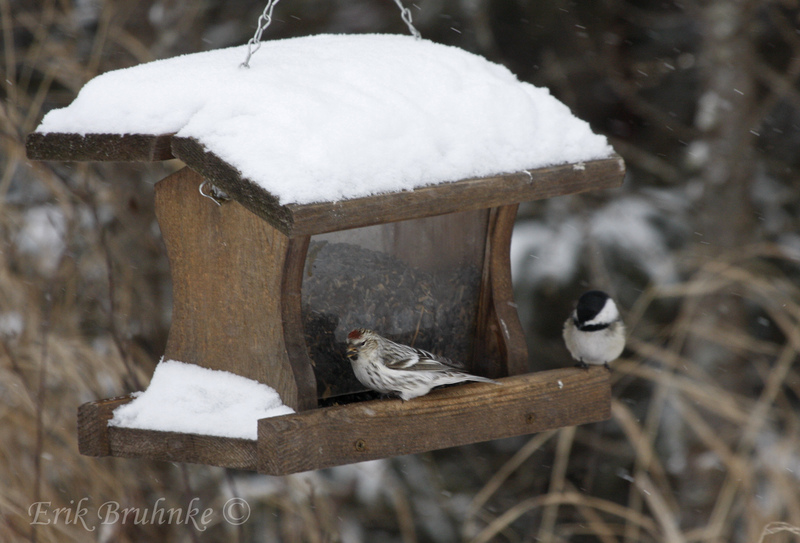 My friend Kerry was in Florida for the winter and we had made arrangements to go birding after the festival. I had asked Kerry for her target list of birds that she wanted to see and she listed just one – Snail Kite. I suggested that we go to Three Lakes WMA and then Joe Overstreet Road and the little marina on Lake Kissimmee. The night before we would meet, I was getting tired and I began to worry. What if we didn’t see anything at Three Lakes? What if we missed the Snail Kite? I thought about changing our plan to include more opportunities to find Snail Kite and I fell asleep worrying. Perhaps I dreamed of eagles. Kerry and I would see five Bald Eagles the next day. A night’s sleep must have refreshed me. I awoke feeling much more optimistic and decided to stick with our plan. 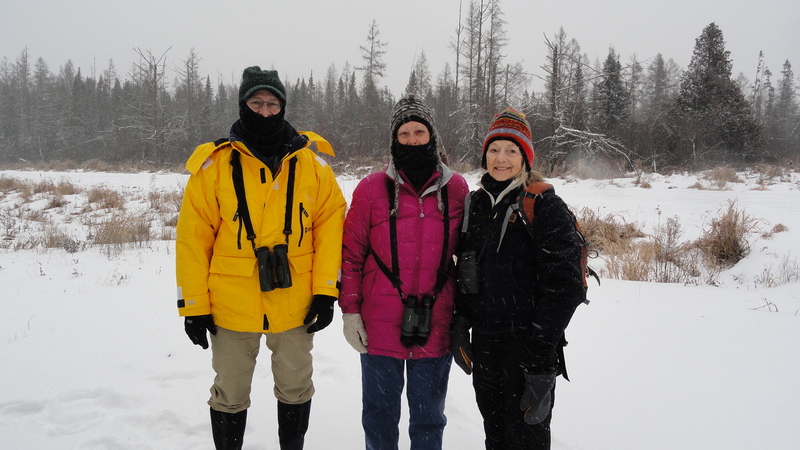 It wasn’t long after our arrival at Three Lakes that we started seeing birds. 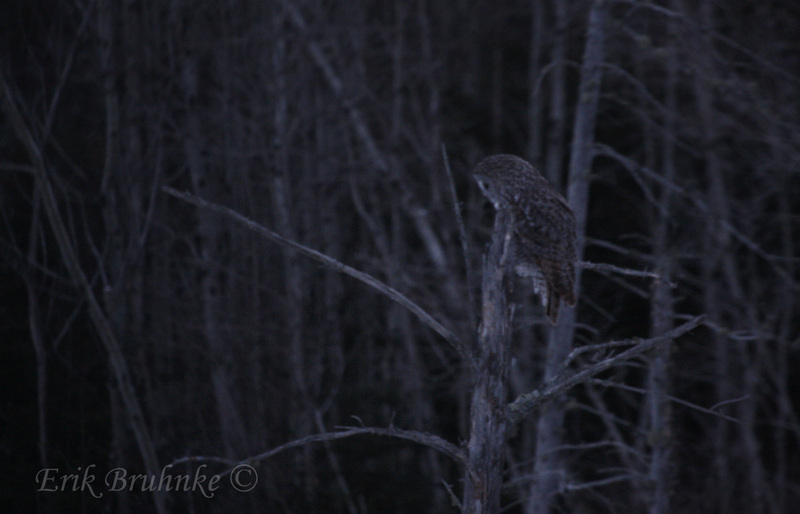 Shortly after we started down the main road, we both caught a glimpse of something light in a distant clump of trees. I thought caracara and Kerry thought eagle. A moment later we saw an eagle fly out. And, then we saw something in the trees again – there WAS a caracara! But, Kerry saw another bird, too. We got out the scope and discovered an eagle perched about 10 feet from the caracara. 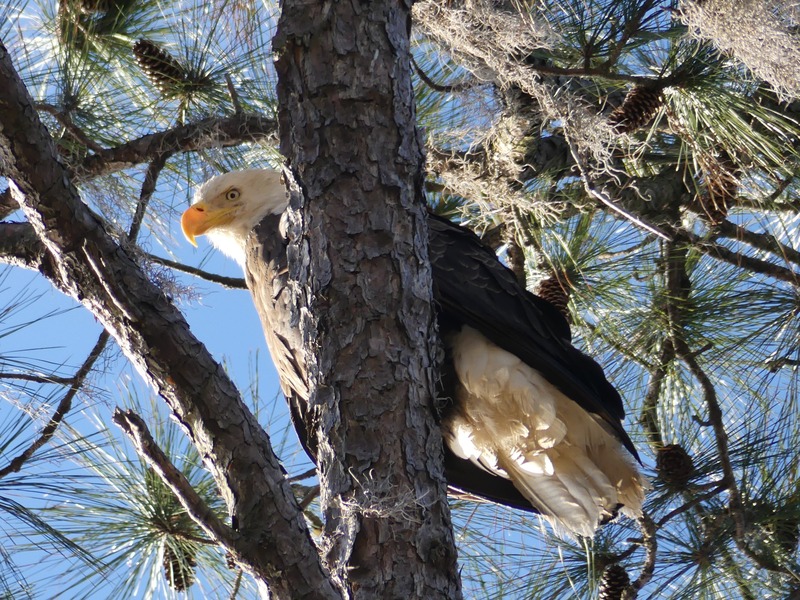 What was a young Crested Caracara doing with two adult Bald Eagles? It was too far for a photo, but I’m sure we will both remember our fascinating raptor sighting. We kept seeing more birds – Eastern Towhees so close that we could see their white eyes (our North Carolina towhees have dark eyes), oodles of beautiful Pine Warblers, an Orange-crowned Warbler, Purple Gallinules, and many more species. 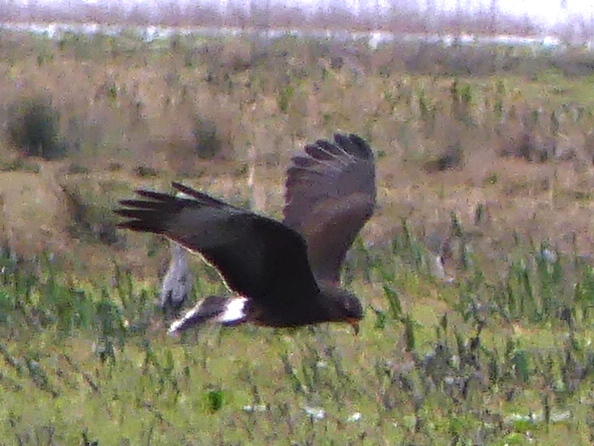 My photo is poor, but our looks at the Snail Kite were great. 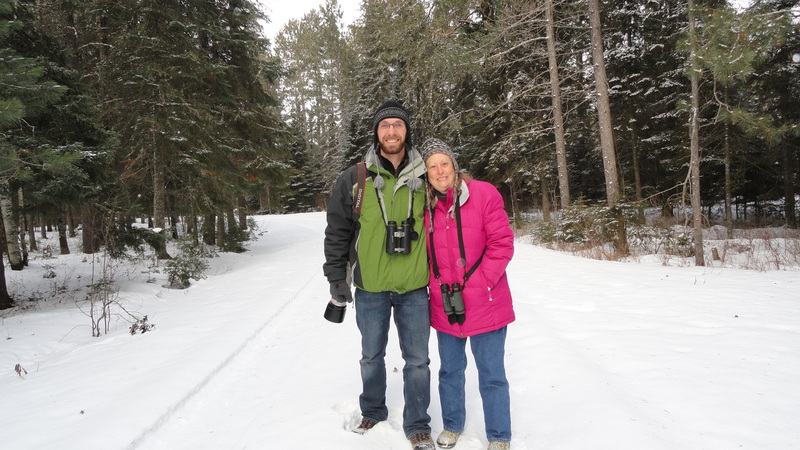 We had such a great time birding at Three Lakes that it was after noon when we got to Joe Overstreet Road. We slowly drove the five miles to the marina, parked the car, and walked to the little pier. Kerry was ahead of me and before I caught up with her, I heard something like, “There’s the Snail Kite. Oh, there are two of them.” We enjoyed the show for about an hour, with great looks at the kites as they hunted for snails, occasionally flying just 20 feet in front of us. I had not needed to worry. We ended the day with 60 species, a life bird for Kerry, and memories of a beautiful day that neither of us will forget. 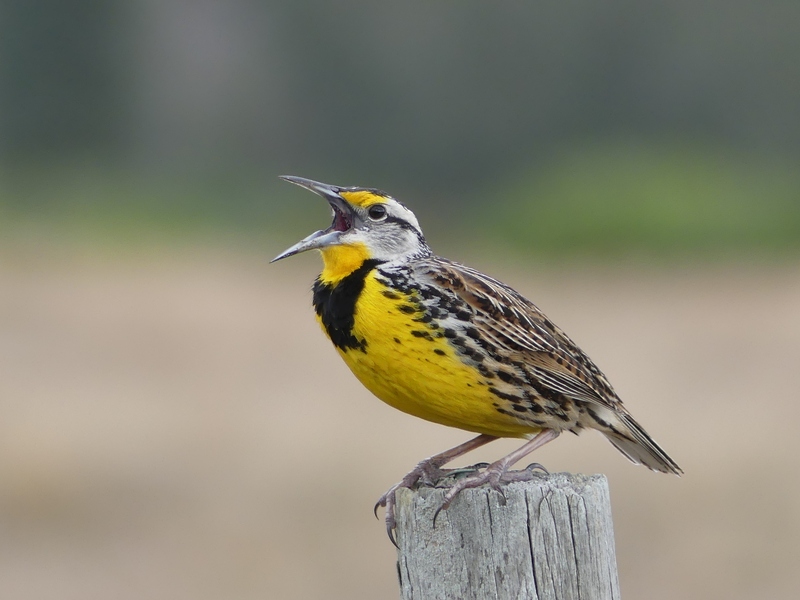 This gorgeous Eastern Meadowlark sat on a fence post outside our car window on Joe Overstreet Road and sang almost non-stop. 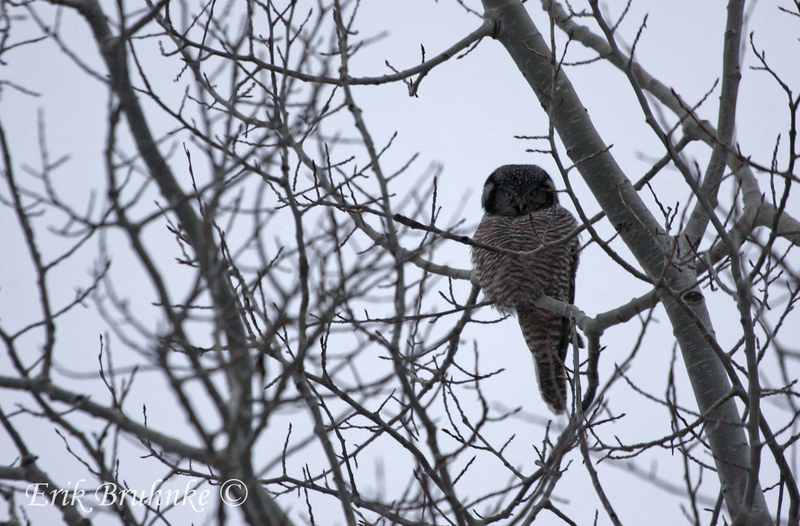 He was still singing as we finally pulled away and continued down the road. It was another great trip to Florida. More photos will be posted to Flickr soon. 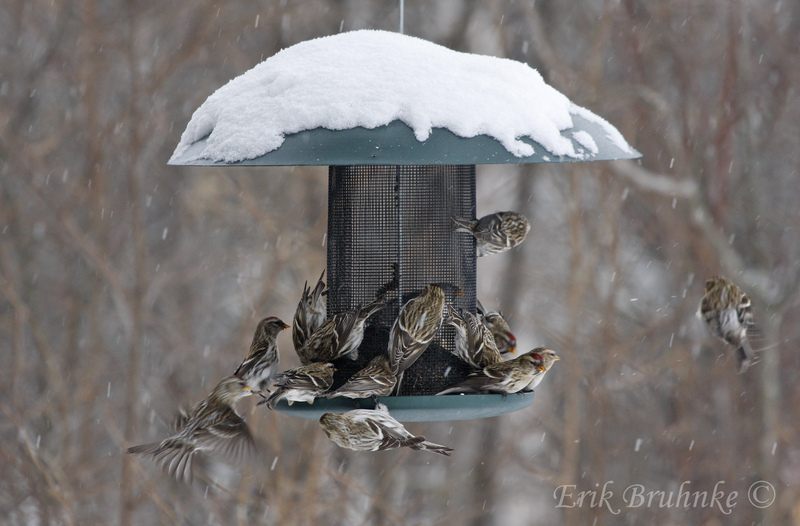 My photos of birds are also on eBird and can be seen here.